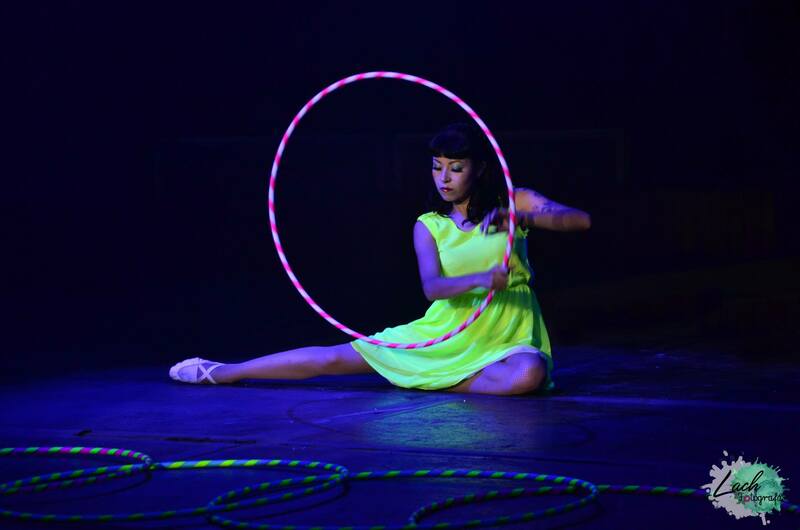 2016 Championships: Big prize money, April 1 entry deadline is almost here! 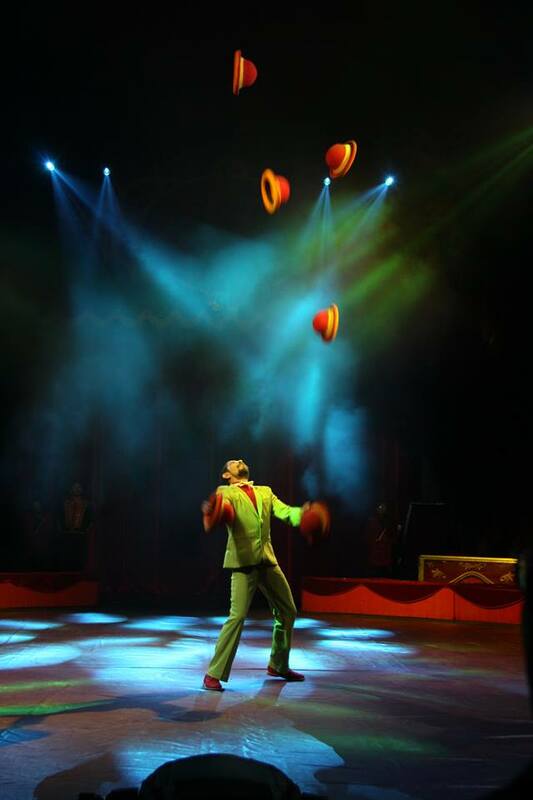 You know those moments when you are at a juggling festival and you witness tricks so amazing, so breathtaking, and so epic that they completely BLOW YOUR MIND? Yeah, it can get pretty intense. We’ve recently started a new video series dedicated to this very theme, aptly named ‘Mind Blown’. 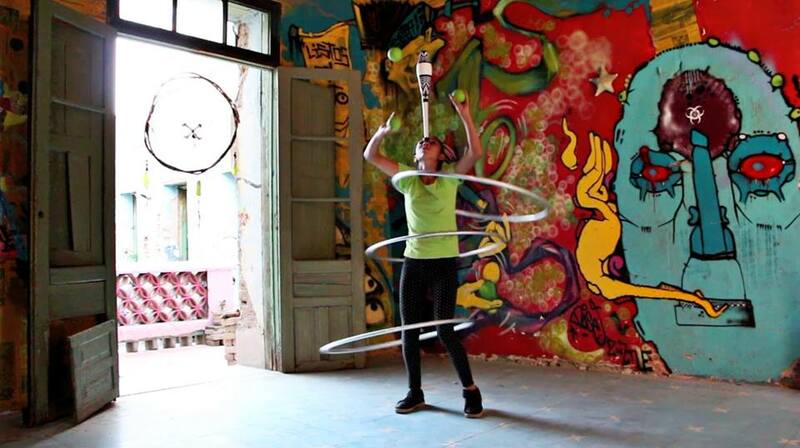 The idea behind this collaborative video series is to have a trick theme for each video and have selected jugglers from all over the world that specialize in that particular style contributing their best tricks for that theme. 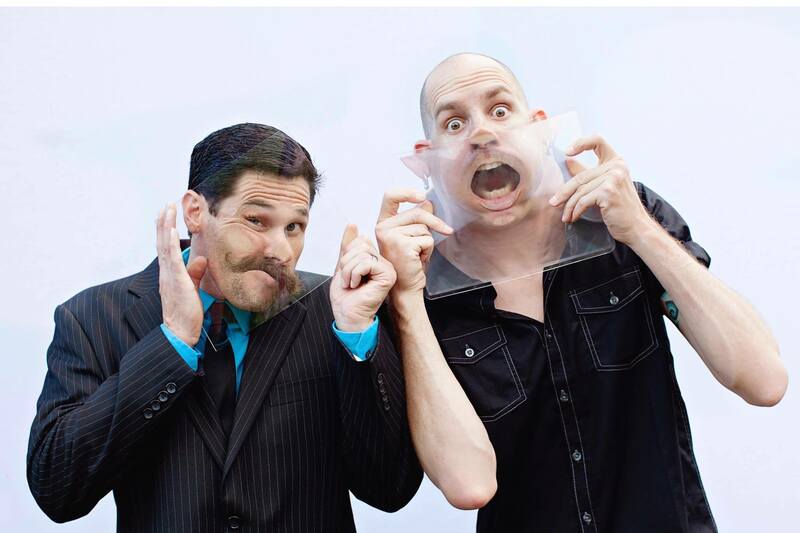 The result: an in-your-face viewing experience so extreme that it will BLOW YOUR MIND! Check out the recently released first video in this series on pinball and BBB tricks. In IJA Board news, Jared Davis has re-joined the IJA Board of Directors, filling in the vacant Board seat. Jared was an IJA Board member from 2013-2015, and we are glad to have him back in the mix! 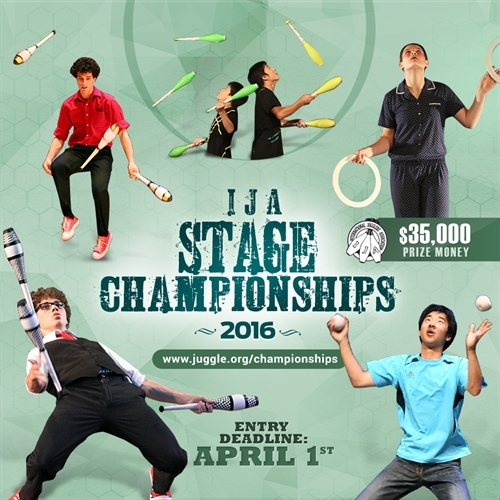 April 1st is the deadline for Stage Championships entries (not an April Fools joke!). This year, we are going to make a point to announce the names of those competing in the stage championships earlier than we have in recent years. With so much prize money on the line this year, who wouldn’t want an early sneak peak at the competition?! 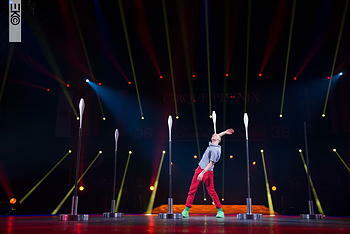 Just what sort of competition will we see in the championships this year you may be asking? While I do not know specifically at this point, one thing is for certain, the championships will BLOW YOUR MIND! 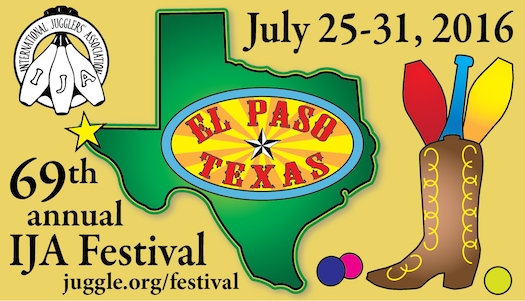 Festival info, including registration, is available at: https://www.juggle.org/festival. 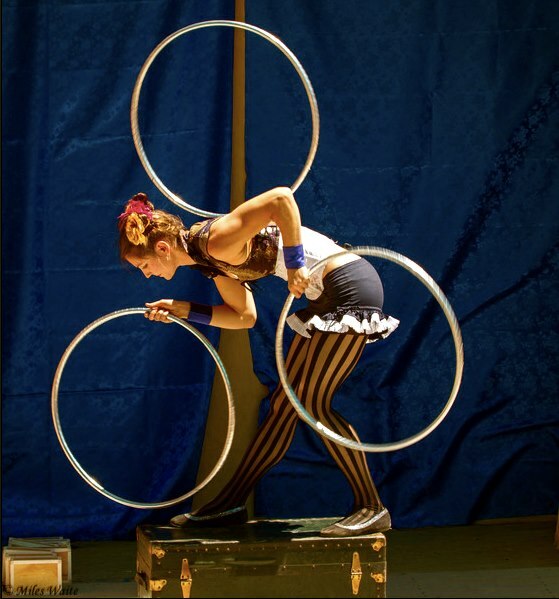 The deadline for entering the Championships, including submitting a video of your full act, is April 1, 2016. The current volunteer directors on the IJA Board are working hard to keep the IJA alive and vibrant. Each year the IJA needs new volunteers to join the Board and help decide the directions the IJA will go. About half of the seven Board seats are up for election each summer for a two-year term. You help out for two years and then you can relax and let someone else step up if you want to. Or, you could offer to run again. Serving on the Board can be very rewarding. Submit a nomination to ijanominations@juggle.org by the May 15th deadline. Email that same address if you have any questions about serving on the Board. 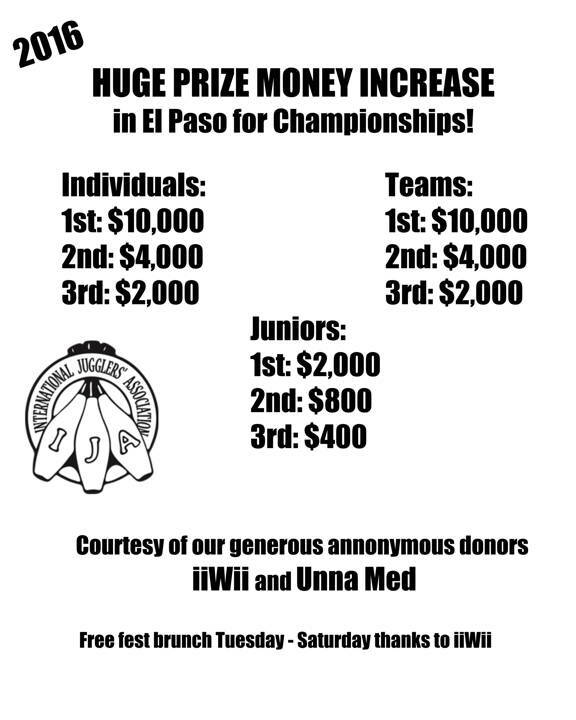 Help promote the IJA and build on a legacy of success. 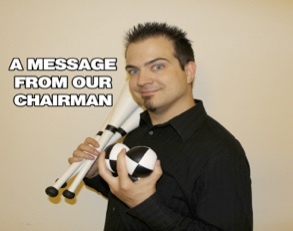 For more details, see: https://www.juggle.org/business/nominations.php. Online fest registration ends at 11:59pm EDT on June 30, 2016. This year’s festival is shaping up to be one for the ages. If you didn’t make the Early Bird registration, never fear — online registration is open through June 30. The same team who brought you Gauntlet 1 and Gauntlet 2 are hard at work designing and planning a whole new set of obstacles to test your juggling agility and nimbleness. But to do it up right, they could use your help. 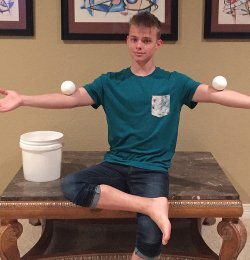 Go to this website https://ym.juggle.org/donations/fund.asp?id=14311 to join the Gauntlet 3 crowdfunding campaign. Unna Med has graciously agreed to match your contribution dollar-for-dollar. Here are some of the challenges you can expect to see in Gauntlet 3. 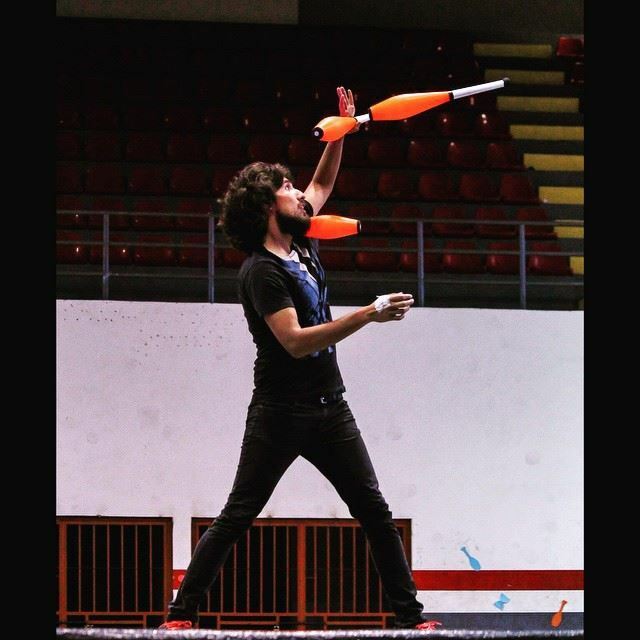 All juggling festivals seem to have one thing in common. 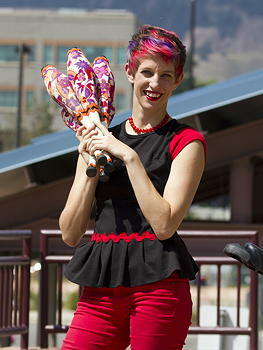 There are budding club jugglers who are just itching to pass like the experts. But, they’re shy. 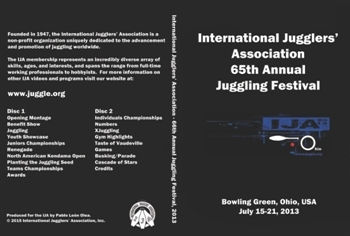 They’ve probably been learning to pass with local jugglers, who are all juggling with people from away that they haven’t seen for awhile. Maybe the beginners are practicing drops with other beginners and just getting discouraged. Probably they are standing around just watching you, even if you’re only doing a basic four count. Once you are comfortable passing clubs, a festival is a great place to meet up with old friends and try insanely complex patterns. After all, that is one of the great benefits of a festival. 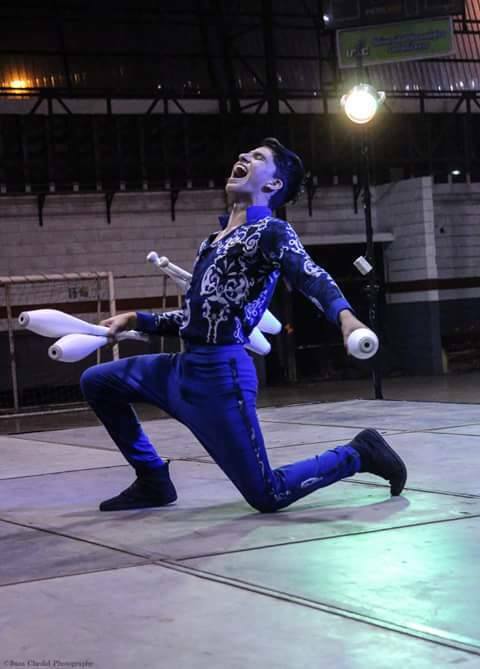 Who can blame the local jugglers for abandoning the beginners who have been frustrating them for months while they seek out their own challenges? But you can fill in the gap by seeking out some of those that are eager to learn but too shy to ask. A good place to start is by seeing if there is a basic club passing workshop. If you don’t mind following the lesson, you can offer to partner someone trying to learn. If there isn’t a workshop, you can offer to teach one. Or just let whoever is coordinating workshops know that you’re willing to do some one-on-one with beginners. Usually you just have to look around to see who needs some help to move up a level in confidence. Sometimes you get surprised. Some years ago I attended a weekend festival in New York. There was a guy standing around with clubs in his hand so I asked if he wanted to pass. “Oh, no. I’ve only passed a couple of times, I wouldn’t be good enough” was the answer. My response was, “OK, let’s see what you can do”. It turned out that he could do a shaky four count, but he had a stable cascade and a decent sense of the count. Five minutes of the three-around exercise took most of the shake out of four count passing. Pickups started to become routine once he got the idea that you don’t have to rush. By the end of half an hour he was confidently returning left and right doubles and beginning to throw doubles back at me. On to three count, since I don’t like to see people stuck on one side forever like too often happens. Once he convinced his left hand to throw to me somewhere close to where I could catch it we started in on doubles there too. I’d never seen anyone advance that quickly. 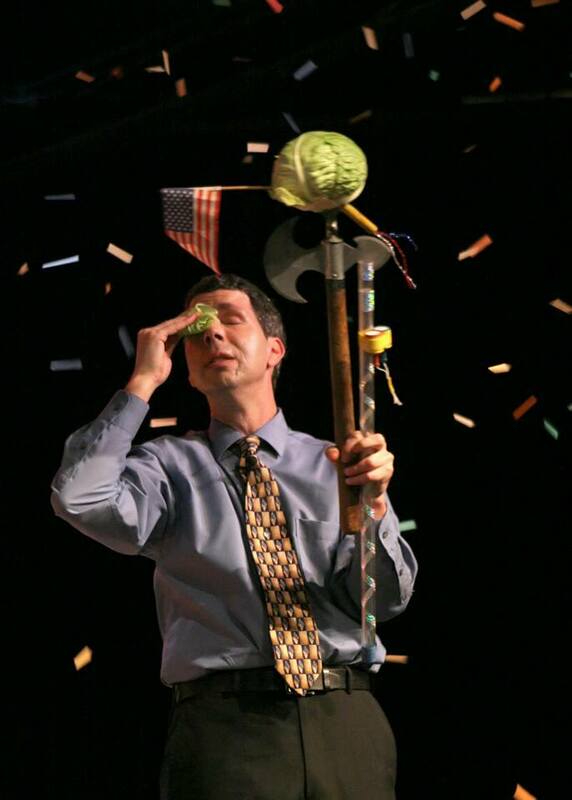 At the end, we actually got through several rounds of Jim’s 3-count. All that in an hour! It would have been fun to be a fly on the wall the next time he passed with the locals. Noblesse Oblige. A whole bunch of people probably taught you how to pass clubs along the way. Take a few minutes to pay that forward at every festival you attend. The people that you help today will probably be juggling the arms off you next year. 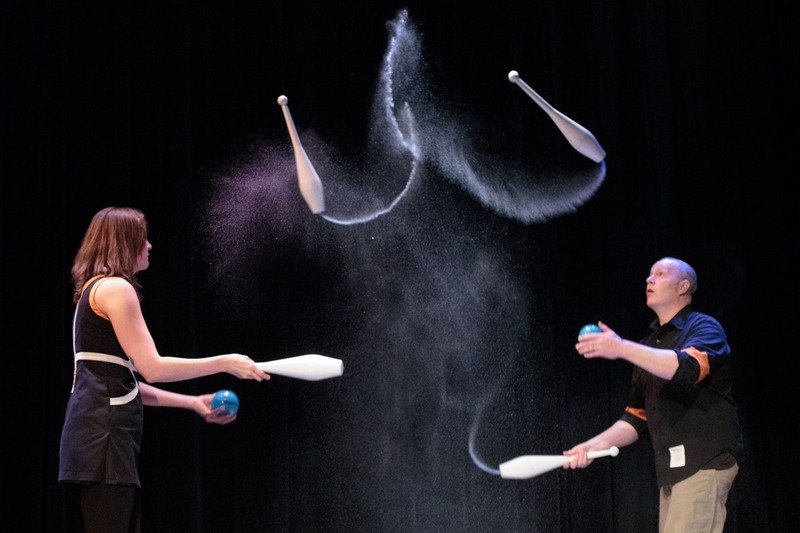 Mr. E’s Night of the Jugglers will be Saturday, April 2, at 7:30pm at the Upper Darby Performing Arts Center (UDPAC), Upper Darby, PA. The show stars Jen Slaw Napolitano, Michael Menes, Michael Lane Trautman, and Michael Karas and is hosted by Mr. E (Jackie Erickson). 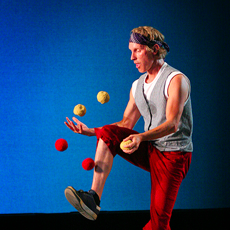 The all-juggling format, immensely popular in each previous show in the ten-year run, will highlight the varied talents of each performer and showcase an excerpt from the off-broadway show “Perfect Catch” featuring Karas and Napolitano as a couple that meets because of juggling and proceeds to … well … be a perfect catch for each other. Tickets are available online at UDPAC or at the box office and are $12.50.